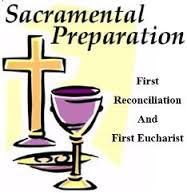 Preparation for these sacraments occurs on three levels; family, school and parish. The schools play an invaluable role in helping the parish prepare for these celebrations. However, they are celebrations of the Parish community, and as such, all inquiries and communication about these sacraments are managed by the parish. It is very important that all parents who wish these children to receive the sacraments make the effort to attend Sunday Mass regularly with their children as part of the preparation process and beyond. As a community, we are most happy to assist families in their preparation for these sacraments. Questions concerning the reception of the sacraments of Reconciliation and Eucharist by children may be directed toward one of the priests who will assist you in the process. For the times of the Sacrament of Reconciliation for those who have previously received this sacrament, please consult our Reconciliation times. Our Grade 2 students will be Celebrating God's Love in the spring of 2019.